Where do I use my Graham & Brown voucher code? Wallpaper is a fantastic way to add a personal touch to your home, for both total room decorations and feature walls. 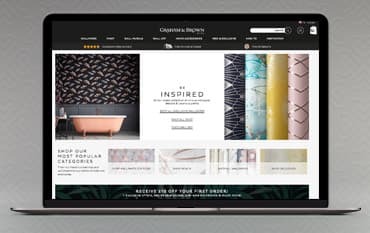 At Graham & Brown, you can shop for your wallpaper by colour, design, room and designer to discover paper in soft blush pinks, deep purples, dramatic blacks and subtle beiges as well as rolls of sparkling glitter, metallic effect wallpaper and designs with subtle mica highlights. You can also discover textured wallpaper and paint in a variety of colours and finishes for interior walls, high traffic, kitchens, bathrooms, metalwork and woodwork. If you’re looking for stylish and unique wall accessories you can also find a variety of wall murals and wall art for every room in your house, including children’s rooms. Discover wall art and murals in a selection of designs including floral and forest, movie and comic, pop art and graffiti, surfaces and travel and cityscape. There are also tons of home accessories available including clocks, cushions, home storage, lighting and mirrors. No matter what your style or taste at Graham & Brown you’re bound to find a wallpaper that suits you. Shop by colour and discover wallpaper in black, blue, teal, white, yellow, orange, grey, green, brown, purple, pink and cream. You can also shop for metallic wallpaper that’ll add dimension and a gorgeous glimmer to your decor, there are rose gold, gold and silver metallic wallpaper available all in different designs and patterns. If you’re looking for a marble effect, geometric, striped, patterned or floral wallpaper you can also find it in the Graham & Brown collection, as well stunning children’s wallpaper that features unicorns, flamingos, dinosaurs and much more. If you’re looking for high-quality paint to match the theme of your new room then check out the vast collection at Graham & Brown. With paints available in various shades of red, orange, yellow, green, blue, purple, pink, neutral, grey, brown, black and white you are sure to find the ideal colour, for a great affordable price. You can also shop through colour collections that include neutral, pastel, bright and deep ranges, to find similar tone colours that’ll create a harmonious look throughout your house. All returns need to be made within 30 days of receipt of goods, unwanted goods should be returned in the original packaging, unopened, undamaged and in a saleable condition. All UK returns are free. Graham & Brown are one of the best brands in the wallpaper and decor industry with exciting ranges of wallpaper, paint, wall murals and home accessories for every taste and style preference. Whether it's a warm damask for the living room, a classic stripe for the hallway or a comforting floral design for the bedroom, you're bound to find the perfect wallpaper for your home at Graham & Brown. And, if you use a discount code from us you can enjoy huge savings on your order too.